Music Business Worldwide analysed the Top 10 songs in the UK, USA and Australia to see how many were written solely by their featured artist. Out of the 16 songs common to all three charts, only two met the criteria: Trap Queen by Fetty Wap and Take Me To Church by Hozier. The stats on the top-selling singles and albums in Ireland in 2015 have yet to be released by IRMA. We will update this post when the information becomes available. Incredibly, as of January 15, 2016, Take Me To Church has been on the Irish chars for 120 weeks and sits at #84. Meanwhile, the album Hozier has spent 69 weeks on the Irish charts and only this week fell out of the Top 10 dropping to #12. In 2014, Take Me To Church was #3 and From Eden was #17 in single sales while Hozier was #2 in sales in Ireland. 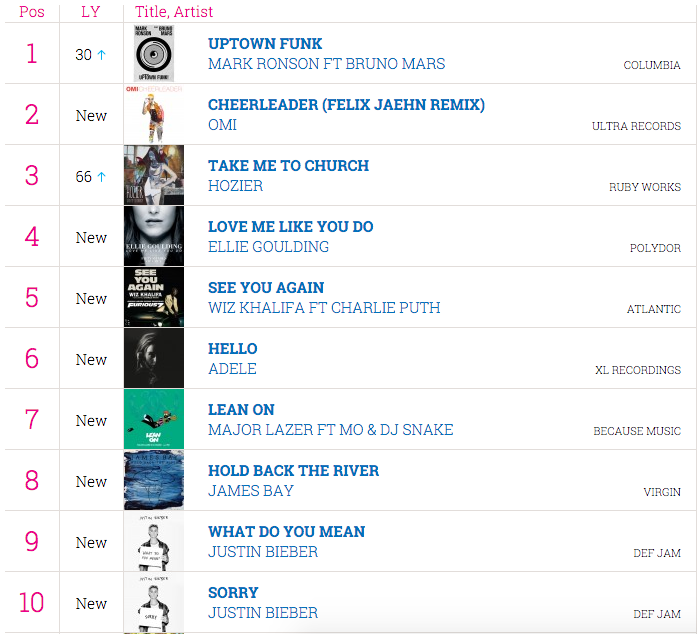 Overall in 2015, Take Me To Church was #3 on the UK Top 40 chart with 1.25 million in combined sales. The song never made it to #1 but peaked at #2 for 4 weeks. Take Me To Church was #4 on the Top 100 singles chart and #8 on the Streaming chart in Australia for 2015. Hozier was the #12 best selling album in Australia in 2015. In 2015, @Hozier’s “Take Me To Church” became the first #1 for an Irishman since Gilbert O’Sullivan’s “Alone Again (Naturally)” in 1972. Take Me To Church was #1 on the American Top 40Adult Contemporary chart for two weeks in February 2015. Billboard.com released their 2015 year end charts and Hozier had an absolutely brilliant showing! As debut albums go, this one set the bar very high indeed. With Hozier’s tour coming to a close in under 7 weeks, he’ll take some time away to rest, regenerate and work on the next album. This interview perfectly sums up Hozier’s thoughts about chart success and creating the next album. Tagged 2015, American Top 40, Billboard, Canada, charts, Ireland, RTE 2fm, UK, USA. Bookmark the permalink.